Rajinikanth's daughter Soundarya married actor-businessman Vishagan Vanangamudi on 11 February in Chennai. While at the reception, they donned traditional clothes (Soundarya in a striking blue and gold sari, Vishagan stuck to a white shirt and veshti), for the photo shoot, they were also seen in comfortable, western semi formals. According to reports, several other actors like Sivaji Prabhu, Manjima Mohan, Mohan Babu, Andrea Jeremiah, Anirudh and Aditi Rao Hydari and filmmaker Mani Ratnam were also present at the wedding. Filmmakers P.Vasu, KS Ravikumar, Selvaraghavan and Kasthuri Raja also attended the nuptial. After four days of pre-wedding festivities, the couple took seven vows today in attendance of their family members and close relatives. 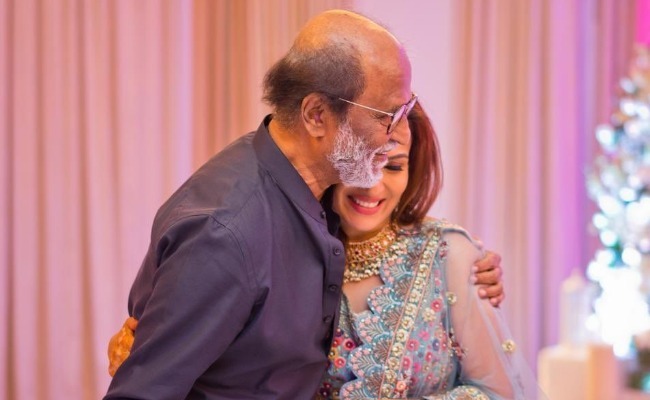 Earlier, Soundarya shared a lovely Instagram post expressing her love for the three important men in her life - her son, father and would-be husband. The video shows the actor breaking into an impromptu jig on the tunes of the song 'Oruvan Oruvan Mudhalali' from his film Muthu. Vishagan, on the other hand, made his acting debut a year ago with Tamil thriller "Vanjagar Ulagam". In 2010, she had married industrialist Ashwin Ramkumar and the couple even have a son named Ved. # Vishagan Vanangamudi is a businessman and owns a pharmaceutical company. She made her directorial debut with Rajinikanth starrer Kochadaiiyaan and followed it up Dhanush-starrer, VIP 2.